The electronic health record vendor is working on a version that would run on monitors such as Microsoft Surface and feature four distinct panels to help doctors make decisions. LAS VEGAS – While eClinicalWorks is demonstrating its latest cloud-based EHR and new offerings for inpatient settings at HIMSS18, CEO Girish Navani gave a glimpse of the forthcoming iteration — and the goal is to resemble a Bloomberg Terminal. The hosted service would make a bold step forward for the EHR vendor that last year settled a $155 million case with the U.S. Department of Justice in a False Claims Act suit. Much in the way the Bloomberg device delivers information to help bond traders make decisions in near real-time, the next version of eClinicalWorks will provide doctors with four key technologies each on its own screen. Navani described the setup as such: A physician walks into her office with a big monitor that has a population health panel containing information about the patients the doctor will see that day, a telemedicine tool for virtually connecting with patients, a voice-based virtual assistant for interacting with the software and a machine learning-based panel making evidence-based clinical suggestions. Navani pointed for example to machine learning’s potential use cases in the common alerts about lab results that can flood a doctor’s inbox. Machine learning could not just separate the abnormal results that require immediate action from the normal one that do not but, what’s more, it could identify an atrial fibrillation patient with a high potassium level who needs to go to an ambulatory facility immediately because a serious problem could manifest in 24 to 48 hours. eClinicalWorks is currently developing the software to recognize hardware monitors, such as Microsoft Surface, that work with Google Chrome, Navani said. 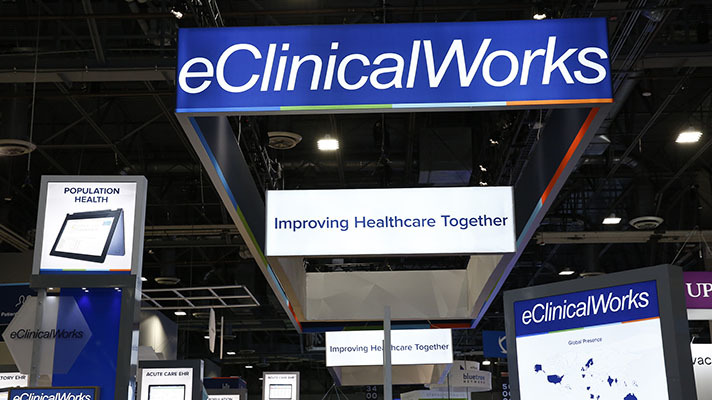 Navani said eClinicalWorks is planning to debut the forthcoming version, roll it out in late 2018 into early 2019 and show it at next year’s HIMSS conference. eClinicalWorks is in Booth 145.